Kensington Palace Pavilion is the only place in London where you can enjoy a traditional afternoon tea in the grounds of a royal palace. Sit back, relax and treat yourself to beautiful food and drink surrounded by over 300 years of royal history. We are open from 10am serving breakfast and lunch as well as afternoon tea. 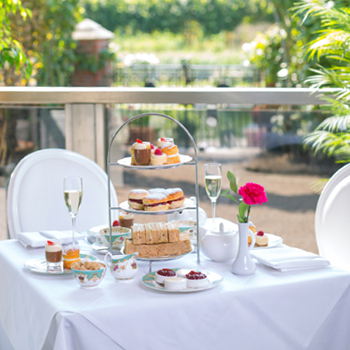 Surrounded by beautiful formal gardens in the grounds of Kensington Palace proudly stands The Kensington Palace Pavilion; a relaxed and elegant setting for breakfast, lunch or classic afternoon tea. The Kensington Palace Pavilion overlooks the Sunken Garden, planted in 1908 and terraced with paving and ornamental flower beds. Its vibrant colours and exotic planting provide a peaceful, yet stunning backdrop for the restaurant’s simple and honest menu of delicious English dishes. All eggs are served on an English muffin and are drizzled in hollandaise sauce. The Kensington Palace Pavilion is open from 10.00-16.00. To avoid queues at busy times you are welcome to make a booking using the reservation tool. For reservations for more than 12 guests, please call us on 020 3166 6113. Access to The Kensington Palace Pavilion is via Hyde Park and Kensington Gardens. Use District & Circle lines to High Street Kensington (10 – 15 minutes walking time) or Bayswater (15 – 20 minutes walking time). Hill Gate (20 – 25 minutes walking time). Bus routes: 70, 94, 148, 390 to Bayswater Road or 9, 10, 49, 52, 70, and 452 to Kensington High Street. Taxis can bring guests directly to The Kensington Palace Pavilion via Jubilee Walk (accessed by Orme Square Gate off Bayswater Road, W2 4RU). 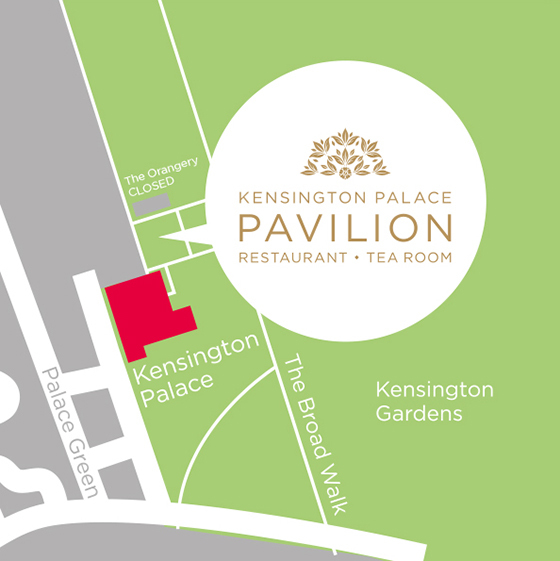 Please email The Kensington Palace Pavilion if you have any questions or enquiries. 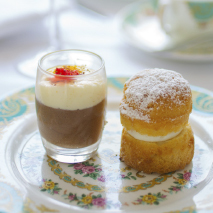 Our beautifully presented afternoon tea gift vouchers give double the pleasure; the delight of opening the gift and the wonderful experience of The Kensington Palace Pavilion visit. The gift voucher will be sent by first class post (UK only) and is valid for six months. We serve afternoon tea from 10.00 to 18.00 in the summer (1 March to 31 October) and from 10.00 until 16.00 during the winter (1 November to the end of February). To purchase vouchers please click here or call us on 020 3166 6113.